The notion that a virtual classroom could be brought to life solely online came to fruition through a grant between two districts, some innovative thinkers, and legislative support. FLVS started with 5 high school courses and 77 enrollments. Everyone watched and waited to see if students could achieve academic success. In addition to student learning gains, teachers made wonderful connections with both students and parents—all online. Remind yourself of technology in the late 1990s. There were dial-up modems which were temperamental—and noisy; super slow internet browsing ability; cell phones came into play but there were pagers and/or beepers to notify you that you needed to get to a landline phone to call someone back—and that phone may be rotary dial. Don’t forget good ole, tried and true paper and pen, which are still respectable tools to this day. But imagine back when there was not much in the way of automation or integrated systems and you had to log and document everything by hand…oh my. Our 20th anniversary has been a celebration and significant milestone built on education, technology, partnerships, and evolution. And evolve we have—from a small institution with seven staff members to now employing more than 2,000 teachers and support staff serving students in Kindergarten-12th grade. 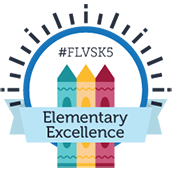 FLVS has seen more than 3.6 million semester course completions in its two-decade history. With the help of the Florida legislature and Governor, FLVS has grown to serve all 67 Florida districts through franchise partnerships and serves all 50 states in some capacity through FLVS Global. In the seven years I’ve been with this great institution, I’ve had the privilege to be part of some exciting technological and educational advancements. 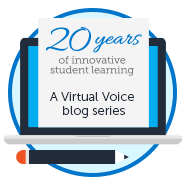 Yet, one thing remains the same as it was 20 years ago—FLVS continues to make decisions with students and families in mind—passionately pursuing fairness, equal rights, and access for all to have a solid education. Thank you to those who took a leap of faith and gave virtual education a chance. It’s been an incredible 20 years, and we look forward to our next chapter. This entry was posted in Educator Edition, Parent Edition, Student Edition and tagged #FLVSTURNS20, 20 Years, 20 Years at FLVS, 20th Anniversary, A Day in the Life, History, History of Florida Virtual School, History of FLVS, History of Online Education, innovation, Looking Back, Milestones, Online Learning, Online Learning in 1997, Opening of FLVS, Trends in Online Learning on June 19, 2018 by Suzan Kurdak.